Associate Dean of Research with UBC Okanagan’s Irving K. Barber School of Arts and Sciences John Klironomos has been named a fellow of the Royal Society of Canada. It is the highest honour to be bestowed upon a Canadian academic. UBC Okanagan’s John Klironomos, an expert in plant and soil ecology, has been named a fellow of the Royal Society of Canada (RSC). The RSC made its announcement today, listing more than 90 university academics as the newest fellows admitted into one of Canada’s oldest scholarly organizations. The RSC was established in 1882 with the primary objective to promote learning and research in the arts, the humanities, and the natural and social sciences. Klironomos, a biology professor and Associate Dean of research with the Irving K. Barber School of Arts and Sciences, says he is humbled by all the attention. “It is a great privilege and I am extremely grateful to be in that kind of company,” says Klironomos. UBC Okanagan’s Provost and Vice-Principal Academic Cynthia Mathieson says the university is proud of Klironomos and his research. She notes the recognition brings great honour to the campus. Klironomos was nominated by former UBC President Stephen Toope. Klironomos’ research on mycorrhizal symbioses and plant-soil feedbacks has had major impact on several disciplines in ecology, says Toope, adding that the popular professor is well known for his creative experimental approaches and his research has made profound contributions to various problems in terrestrial ecology. Royal Society of Canada President Graham Bell says election to the RSC is the highest honour a scholar can achieve. This is second honour presented to Klironomos this year. He was recently named a fellow of the American Association for the Advancement of Science for his contributions to the field of plant and soil ecology, particularly for empirical studies on plant-microbe interactions and the structuring of plant communities. Klironomos will be officially inducted into the fellowship in November at the RSC’s annual general meeting in Quebec City. 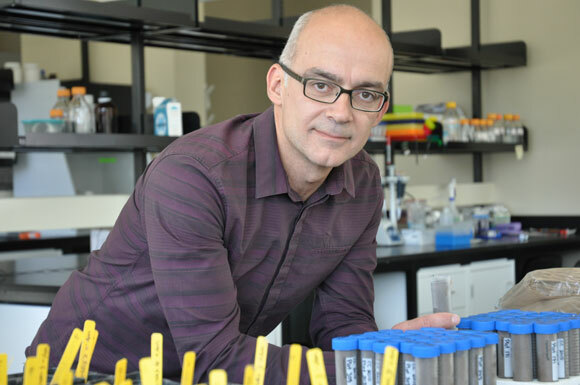 He is the second Royal Society of Canada fellow at UBC Okanagan. Prof. Doug Owram received the distinction in 1990.